Currently, RecordsKeeper XRK Token Public Sale is live. Here is an easy step by step guide on how to participate in Public Sale. 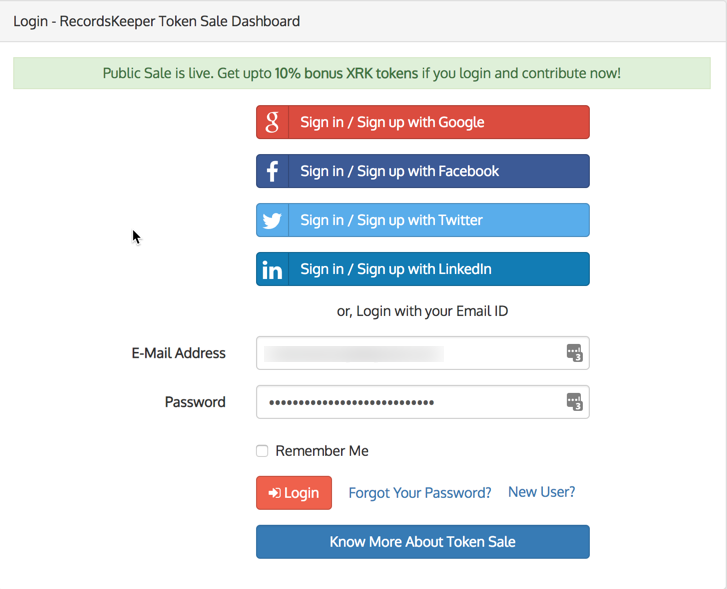 Step 1: To participate in RecordsKeeper Token Public Sale you have to visit https://tokensale.recordskeeper.co/login page. Step 2: If you are a new user then you can click on the New User link given at the bottom of the page. Then you can sign up using Google, Facebook, Twitter, LinkedIn or by filling all the required details and then clicking on the Register Button. 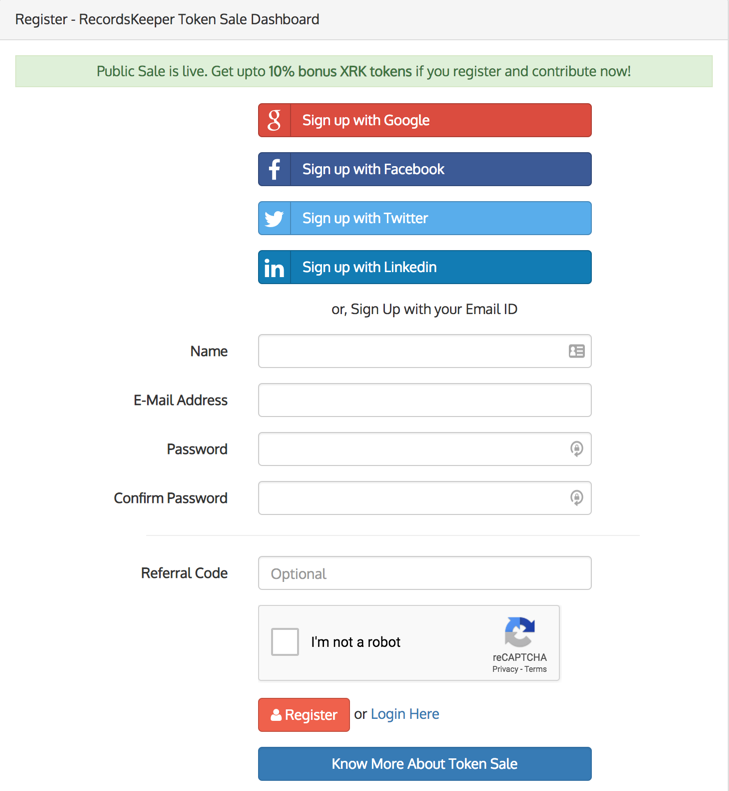 Step 3: If you are already a registered user then you can directly login and access dashboard. 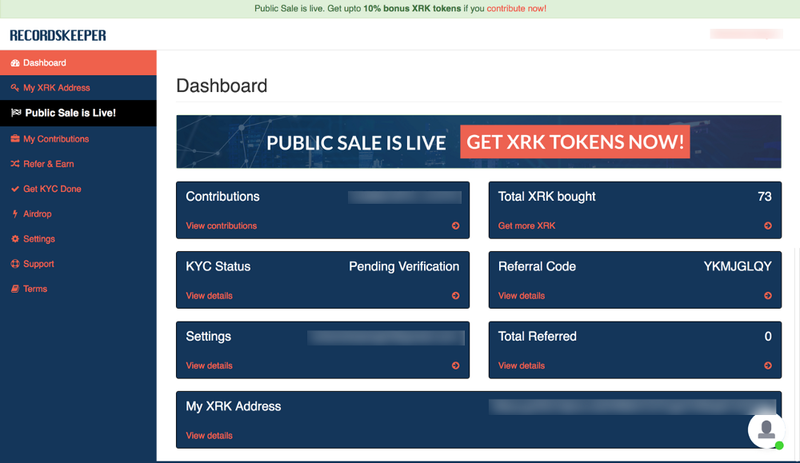 Step 4: After logging in you will see a Dashboard which shows all the details related to your activity like your contributions, XRK bought, KYC status, Referral code, XRK address etc. Step 5: Next is My XRK Address page where you have to enter your valid XRK Address in the given input box and then click on the Save XRK Addressbutton to save it for receiving XRK tokens after the sale is over. You can create a new XRK address or provide an existing one, if you have already. Please keep your private key safe and secure. You can change your saved XRK address multiple times before the sale ends, after that it gets locked and you will receive your XRK tokens in that address only. Step 6: Next is the Contribution page where you can contribute any number of times in Bitcoin (BTC), Ether (ETH) or both. You can see BTC address with a button given to copy it. Before copying address make sure the address shown in image with blue background is same as above. This is just for security purpose.  If both address are not same you should contact RecordsKeeper team using Contact us link. You can also check how many XRK tokens you will receive by entering the BTC amount that you want to contribute and then click on the Convert to XRK button which will show you the number of XRK that you will receive and the extra bonus tokens offered as per the current sale offer. Similarly, for Ether also you should confirm that both displayed Ether address are same. You can also check how many XRK tokens you will get for a particular number of Ethers. 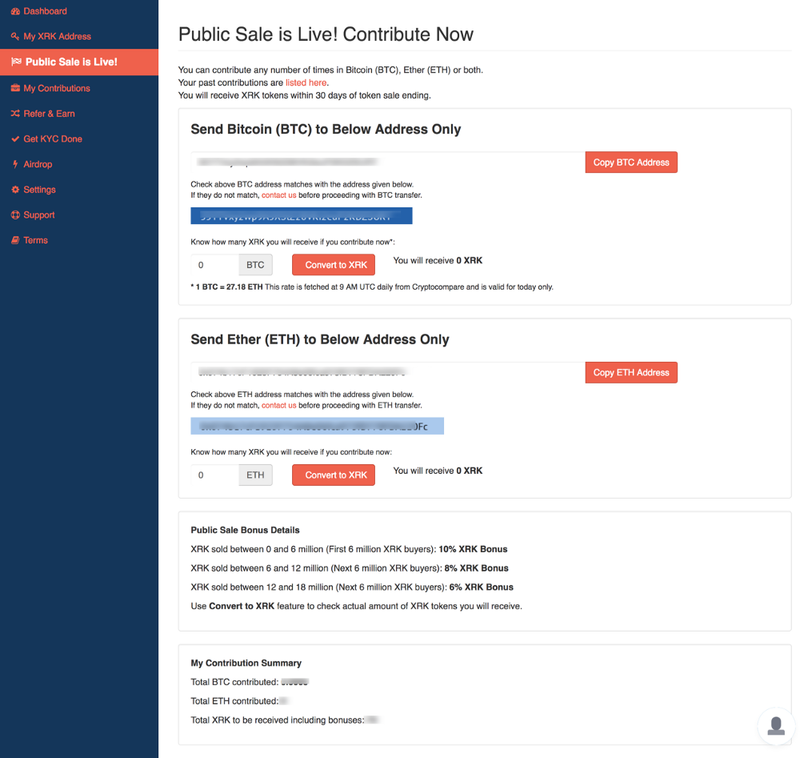 Step 7: There is a section given at the bottom which provides the Public Sale bonus details. You can check that out before making contributions, so as to have a much better idea of the sale. Anyhow, these bonuses are taken into account when you use Convert to XRK feature, so you don’t have to do the math. Step 8: There is a My Contributions page where you can find all your transactions with all the necessary details. It also shows your Contribution Summary which includes your BTC and ETH contributions and the amount of XRK tokens you will receive in exchange of it. You can click on the transaction hash to verify the transaction stored on the Bitcoin or Ethereum blockchain. Dashboard has other sections also like Referral, Airdrop, Settings etc., but we have covered the ones needed to participate public sale. You can contact RecordsKeeper team for any other queries by clicking on the chat icon on bottom right corner of the dashboard screen.